CoolSculpting is an FDA-cleared, breakthrough, non-invasive technology that reshapes the body by literally chilling away areas of stubborn fat that diet and exercise alone can’t reduce. Safe and effective, it gently targets and cools unwanted fat cells in the selected area to induce a noticeable, natural-looking reduction in fat bulges. You’ll see undeniable results after just one visit. 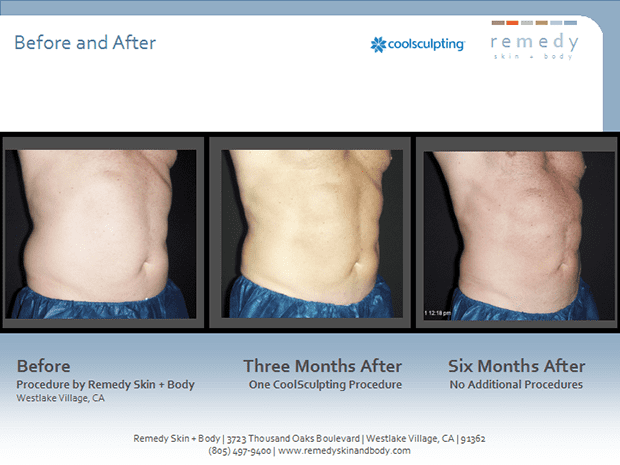 Remedy is one of the earliest practices to begin performing CoolSculpting and was the first in the Conejo Valley. See For Yourself: Before & After Photos of Actual Remedy Patients. Q. 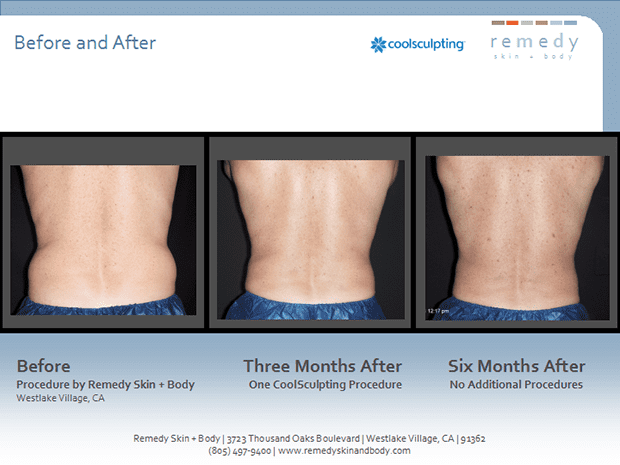 Is CoolSculpting right for me? A. If you can grab a handful (or two) of fat, CoolSculpting may be perfect for you. While it doesn’t replace diet and exercise, CoolSculpting is good for going after areas of stubborn fat like tummy pooch, love handles, and back fat that diet and exercise alone often can’t mitigate. A. CoolSculpting’s patented process cools fat cells down enough so that the water inside them crystallizes. Because these crystallized fat cells look foreign to our bodies, they are broken down and naturally filtered out of the body. A. As with any aesthetic treatment, the timeline for visible results varies from patient to patient. In general, CoolSculpting patients report noticing some distinct fat reduction within 3 weeks of treatment, with continued improvement over the subsequent 3-4 months post-treatment as the body continues to flush damaged fat cells. A. Many patients report seeing visible changes to their body’s contours after just one treatment. Some patients experience much greater reductions than others. Treatments can be repeated for additional “slimming” and results, if desired. Q. 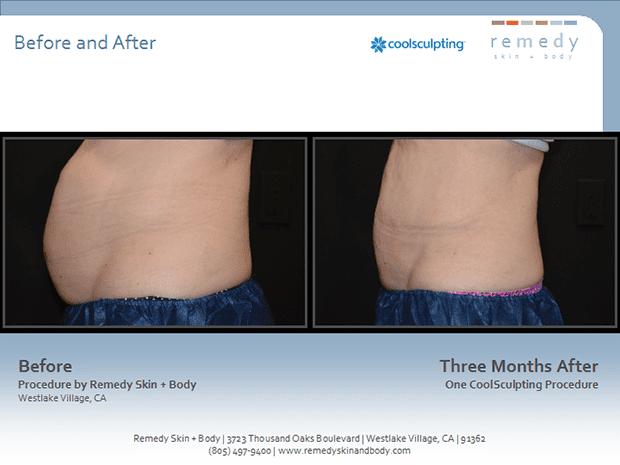 Is CoolSculpting Safe? A. Developed by Harvard scientists and cleared by the FDA, CoolSculpting has an excellent safety profile. Q. Are there needles or incisions? Does it hurt? A. CoolSculpting is completely non-invasive. No needles, injections, or incisions. It uses an applicator cup (we have multiple sizes available) that enables vacuum pressure to draw tissue between cooling panels. Most people do not describe the procedure as painful, though they do feel pressure. The sensation is very tolerable without anesthesia or numbing and most patients read, work on a laptop, listen to music or just relax during the procedure. The treated area may look firm or feel stiff immediately after the procedure. This is normal and dissipates within minutes. Q. How long does it take? Is there downtime? A. Appointments usually last 1-2 hours and you can typically resume normal activities afterwards such as returning to work or going to the gym. You may have seen CoolSculpting featured on The Dr. Oz Show, Good Morning America, or Nightline, or read an article in countless newspapers and magazines. The buzz is warranted.